Matthew 10:34 Do not think that I came to [a]bring peace on the earth; I did not come to bring peace, but a sword. 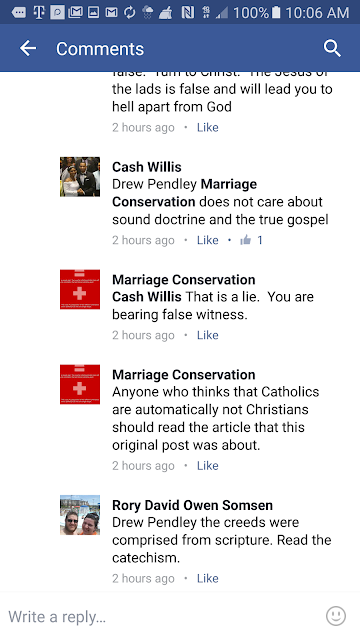 Marriage Conservation classifies itself on Facebook as a Church/Religious Organization. In its about section it claims it is "Preserving and promoting the Spiritual , Moral, and Philosophical Reasons for Traditional Marriage"
Its mission statement is "Supporting Christian Marriage and Sexuality"
This Facebook page spreads a false gospel by promoting ecumenism. What is ecumenism? "Ecumenism can also be defined more broadly: “a movement that promotes worldwide unity among all religions through greater cooperation.” For example, a Christian priest may invite a Muslim imam to speak in his pulpit, or a church may get together with a Hindu temple to hold a joint prayer service. Defined this way, ecumenism is definitely wrong. We are not to be “yoked together with unbelievers” (2 Corinthians 6:14; see also Galatians 1:6–9). Light and darkness have no fellowship with each other. First of all, are those we are joining with truly Christians in the biblical sense of the word? Many people and organizations reference the name of Jesus Christ and even state He is Lord and Savior yet clearly reject what the Bible says about Him. Obvious examples of this are Mormons and Jehovah’s Witnesses, who call themselves followers of Jesus Christ and claim to be “Christian” yet deny what the Bible declares concerning Christ’s nature and work. A not-so-obvious example is liberal Christianity. Liberal Christianity is found in almost every denomination, and, although it may seem Christian, it usually rejects several essential truths. Liberals often deny or diminish the inspiration and authority of the Bible (2 Timothy 3:16), the exclusive nature of salvation in Christ (John 14:6; 1 Timothy 2:5), and the total dependence upon God’s grace, apart from human works, for salvation (Romans 3:24, 28; Galatians 2:16; Ephesians 2:8–9). There is a major emphasis in our day on ecumenical unity among evangelicals and Roman Catholics. Those who promote such unity state that both groups are Christian and both are God-honoring systems of faith. But there are substantial differences between the two groups. 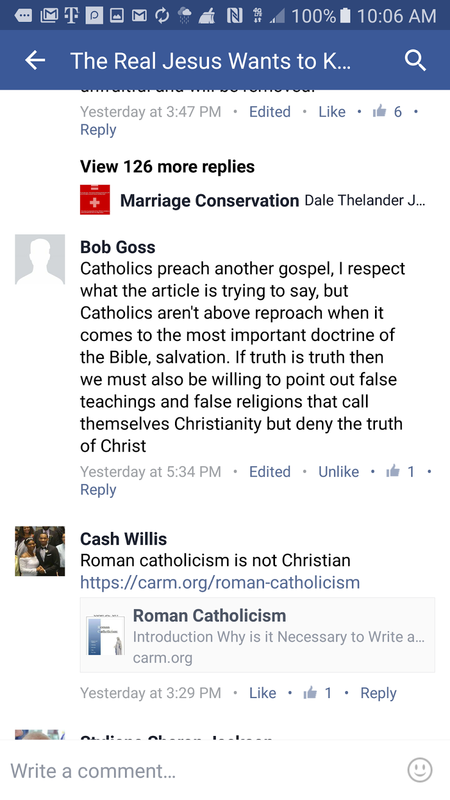 Biblical Christianity and Roman Catholicism are two different religions that practice and believe different things about how one is saved, the authority of the Bible, the priesthood of believers, the nature of man, the work of Christ on the cross, etc. The list of irreconcilable differences between what the Bible says and what the Roman Catholic Church says make any joint mission between the two impossible. 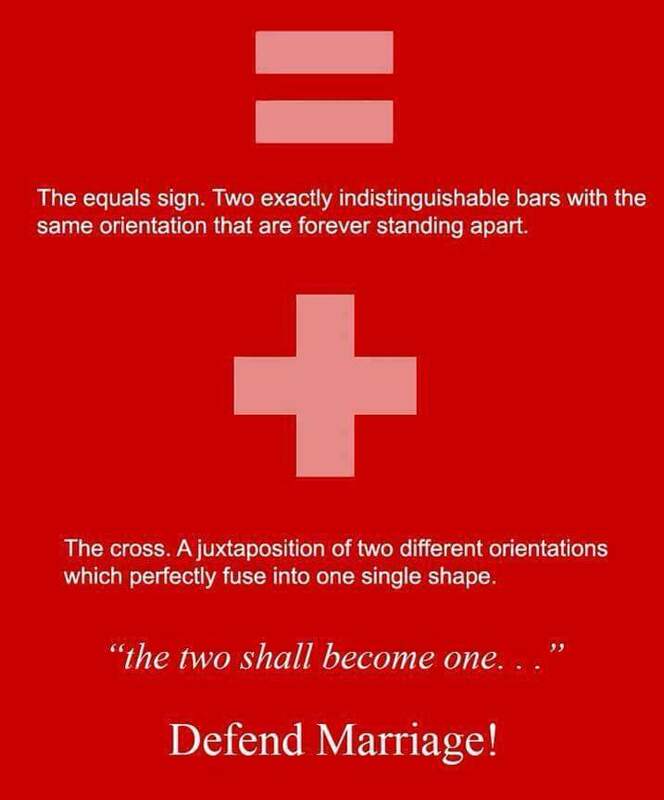 Those who deny this are not being true to what they say they believe, no matter which side they are on. 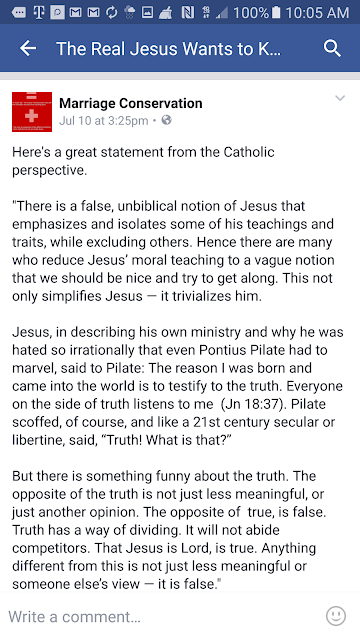 Any Catholic who is serious about his faith will reject what a serious evangelical Christian believes, and vice-versa. One of the draws of ecumenism is that often theologically divergent groups are passionately like-minded regarding certain issues. Biblical Christians usually hold a strong pro-life stance, a traditional view of the family, a conviction to care for the homeless and sick, and a desire to see justice in the world. Other groups, which may have unbiblical theology, can hold the same social positions. Thus, the temptation to pool resources in pursuit of a common cause is sometimes great. This leads to the next question. Second, what is the ultimate goal of this ecumenical venture? Scripture gives clear guidance as to how Bible-believing Christians are to live. Colossians 3:17 states our purpose this way: “Whatever you do, whether in word or deed, do it all in the name of the Lord Jesus, giving thanks to God the Father through him.” Regarding our interactions with the lost, Jesus says in Matthew 5:16, “Let your light shine before others, that they may see your good deeds and glorify your Father in heaven.” Matthew 28:18–20 and 1 Corinthians 2:2 make the gospel our top priority. All that we do is to bring glory and honor to God, we are to live in good works before a lost and dying world, and we must bring to the world the life-changing message of the gospel. Sharing the death and resurrection of Christ brings glory to God and should motivate our interaction with the world. Regarding ecumenical ventures, we need to ask whether or not these goals are being pursued. Often, sharing the gospel becomes an afterthought, if it is even thought of at all. In place of the gospel, ecumenism tends to focus on political and social messages. Rather than seek to transform hearts, ecumenical endeavors often seek to transform environments—political, social, or financial. The ultimate goal of our actions should be the salvation of lost sinners (Ephesians 2:1–3). The angels of heaven rejoice over one sinner who repents (Luke 15:10). There is nothing in the Bible that says the angels rejoice when a law is passed, when a well is dug, or when a street is paved. (Not that there is anything wrong with accomplishing those things, but they cannot be allowed to overshadow the gospel.) As we contemplate ecumenical ventures, we need to make sure God’s kingdom is being expanded through evangelism. 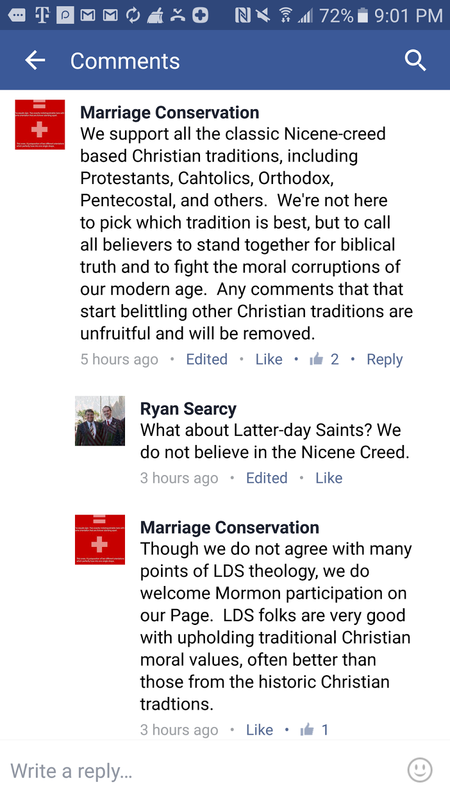 Marriage conservation also aligns with the Mormon church which spreads a false gospel that leads people to hell apart from God. Marriage conservation was confronted directly for not caring about the gospel and sound doctrine but refused to repent. Jesus was very clear in Matthew 10:34 "Do not think that I came to [a]bring peace on the earth; I did not come to bring peace, but a sword." The true gospel divides. Christians are not called to ally with heretical groups that distort the gospel and essential beliefs to pursue a common cause. In fact, God in the Bible says otherwise as seen in 2 John 1:10-11 and Romans 16:16-18. Marriage conservation sacrifices the purity of the gospel to defend God's design for marriage. 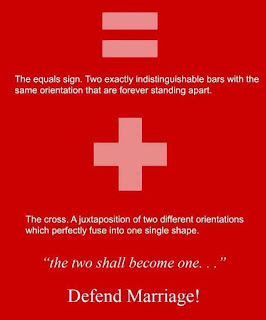 Biblical marriage is to be defended and Marriage conservation does this but marriage conservation is a false group because it does so at the expense of the gospel. This page should be avoided at all costs because it promotes ecumenism which is an attack on the gospel.